Blur are to be honoured for their outstanding contribution to music at next year's Brit Awards. The prize will fuel speculation that the band will reform once more to perform at the event in London's O2 Arena, as the winner usually plays a selection of hits. The honour - to be presented in February - comes 21 years after the release of debut album Leisure, and 17 years after their only haul of Brit wins. Frontman Damon Albarn said: "It's great to have recognition for all the work and all the heartache and all the joy that's gone into this band." There had been rumours that the group might be planning further activities. They got back together in 2009, headlining Glastonbury and playing a handful of other shows, and they talked about recording together. The outstanding contribution prize returns for next year's bash - officially called The Brit Awards 2012 with MasterCard - after being dropped this year. 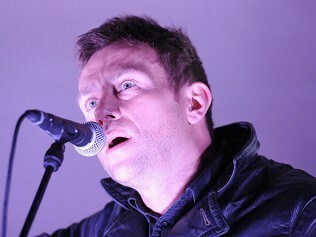 Blur join acts such as Sir Paul McCartney, U2, Paul Weller and Oasis who have been among previous winners. Guitarist Graham Coxon said: "Being in a band this long is like a kind of time travel. "We're the same gang we ever were, we've just landed in a different era. Or possibly we're a totally different Blur still playing the old tunes in 1991 - forever. I haven't decided. But it's always nice to get a Brit Award." Pharrell Williams has been picked to handle the music at next year's Oscars. Jay-Z may not have graduated from high school, but he is encouraging others to value their education. Chart-topping hit Party Rock Anthem has become the biggest selling track of the year on iTunes. 50 Cent has rapped about getting rich. Now he is focusing on getting fit. Sir Tom Jones has been confirmed as a coach for new BBC One talent series The Voice. Charlie Simpson has slammed The X Factor - saying it "doesn't have much soul". Professor Green would love to collaborate with Florence And The Machine. The X Factor finalists look set to team up with their mentors as the series reaches its climax this weekend.